Very stylish, comfortable. I wish the date window was a little bigger. Hard to read. Keeps good time. Price was good. The price was very reasonable. I recommend this watch for yourself or a gift. The Akribos XXIV men's watch displays the time and day in a sleek, circumspect way. Slender ray markers extend around the uniquely burnished stainless steel watch face, while precise, Japanese quartz movement ensures superb accuracy. The understated leather band incorporates a tang buckle clasp for longevity and style that's designed to be just as beautiful as it is functional. After I ordered this watch I was skeptical about how it would look. I figured it would look cheap and fake. Even once it came in the mail I tried it on and didn't really know what to think about it. I've had it for a couple weeks now, and I would never have expected how many compliments I get for it on a daily basis. Its very light and once you break in the leather strap it looks great. Definitely worth it. I love the sleek look of this watch! I can't wait for my son to open it on X-mas morning! Just received this watch for Christmas as a gift, I did pick it out because I have very specific taste in regards to the size and look of the watch. The watch is exactly what I have become to expect from Akribos, it has a very simplistic but classy style. The leather strap is high quality as well. Very pleased with this watch and would highly recommend purchasing this watch. Beautiful men's watch! I bought this for my father as a Christmas gift and he absolutely loved it. It is the perfect size and color. Highly recommend it! this very well may be my "favorite" watch. Of all the Seikos, Bulovas, and other watches in my collection, I wear this AKRIBOS most often. I like the 'simplicity' of the design, the color of the face with the bright color metal, the the plain leather band. It just fits me. Love this watch! I gave it to my husband as a birthday gift and he wears it all the time! Really nice quality and sleek design! I would recommend to anyone who wants a nice size watch but not heavy, the watch itself is a lot lighter than most of his but looks awesome! I bought this watch because it looked great. The price made me question the quality.To my surprise this watch keeps perfect time, is comfortable to wear, and looks beautiful. I am extremely satisfied and recommend this watch if you want a reliable good watch and don't want to spend alot of money..I have a large wrist and leather band fits to last loophole, when buying other watches they fit too tight..Buy this watch and enjoy. My husband loved this watch. A nice leather band compliments the face of the watch. I cant remember the free gift though? In any case, it is worth the price. Very well made. What a stunning time piece this is! I received it today and I must say that it is every bit as beautiful as I expected it to be! My husband has several Akribos' and he loves them. They keep precise time. The leather band is so smooth and just looks so rich! I'm so excited about this purchase and I cannot wait to present it to him! Simply beautiful. I would recommend this time piece to anyone that is looking for high quality at an incredible price. Wearing less than two weeks of normal wear the crystal has cracked. Seems cheap, no way the retail for this watch is realistic. Will try to get a refund. Watch arrived with stain spots on watch face. Watch arrived with indelible spots all over the watch face. Beautiful watch but completely unacceptable in present condition. I bought this watch for my brother and he thought I paid a fortune for it, it is one of his prize watch which he wears only on special occasions. This is my first Akribos but it won’t be my last. I get compliments whenever I wear this and it’s great look and design means it’ll go from t-shirt and jeans to the boardroom very comfortably. 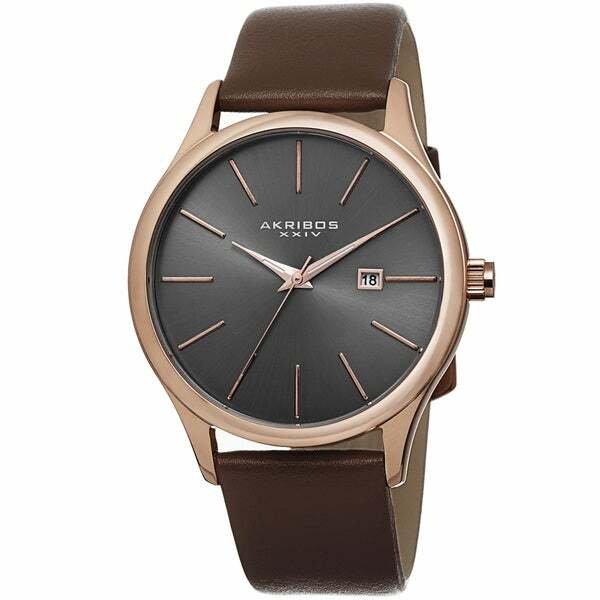 Love the Akribos men's watch! This is a very classy looking watch for the price. My husband is happy with it. Made with cheap quality material. There is no glass. Plastic material used instead of glass. It was ripped when accidently touch to objects. Even 40 to 50 dollar is too much for this watch. to many mechinal problems, no i would not recommend this watch to anyone. I bought this for our oldest grandson for Christmas. He is graduating from college with a degree in Business and Marketing. He thought this watch was very classic looking and will be a be am asset on his interviews. This is a beautiful watch and a great gift. It's easy to read the time and the band is a very nice color. However the face is very big its good for someone with a big wrist. Very good product, came nicely packaged. It arrived a few days late, but it was well worth the wait. Came with a form to fill put for warranty and also came with original price tag on it. This watch was a gift to my son for getting into med school. He loved it. It works for either every day or dressy occasions. It is very classic with a second hand, which helps him when taking patients' vitals. He also loves that it has a leather band because the steel links pull and pinch his arm hair and skin. it is a very sharp-looking watch...Awesome purchase! Beautiful watch! I'm a biased collector and was pleasantly surprised with their warranty service. I definitely recommend it and would buy again. I purchased this watch for my husband for Xmas, and he absolutely loved it. This is a very attractive watch, and it matches his black and silver wedding ring perfectly. It keeps perfect time, it is a perfect size for my husbands wrist. The leather strap is made very well, there is nothing cheap about this watch. We are both very happy with this purchase and would recommend it to everyone. "what size battery does it take? I want to buy one before I get the watch, its a gift." "Is it made in Japan?" The watch is imported from China. This watch has a Japanese Quartz movement but it's manufactured in Hong Kong. "I bought this watch for my boyfriend for Christmas. Not even a month later, the battery died. Where/how can I find a replacement battery? This is ridiculous." Hello amanda, you will be contacted by Customer Care regarding the battery. We apologize this has happened to you. Have a great day! For my Fiance, as a wedding present. He likes dark faces and skinny watches. "Hello Team, please let me know who owns Akribos brand? thanks." Hello Kho Khan, we are unable to disclose the manufacturer of some of our products; however, Overstock.com stands behind every product we sell. When necessary we can contact suppliers if a product issue arises. Thank you for shopping with us. "Did it come in a nice box?" Yes roxylove868, this does come in a nice box. I hope this helps, thank you for shopping with us! Very nice box; exceptional quality! I was Very surprised myself! No, the box is very cheaply made and fell apart.